It’s been a little over a month since Narnia was ready to host guests, but the stairwell was still bare, bare, bare. First I was sick for 2 months, then I went to Dallas for 2 weeks. But I came home from Dallas eager to get going on all the things that hadn’t gotten done yet. One of those was to re-hang my family portrait gallery. As you can see, my husband and I have a lot of ancestors! His are on the left, mine on the right. He has a couple on the landing, too, next to the antique mirror from the old Tivoli theater that Jim & Monique gave us one year. I’ve always loved it there, but now I love it even more because it hints at special things upstairs. We have four kids, too, so they take up a whole wall. Their adult portraits used to hang right where the Gothic window is now, so they had to find a new home. 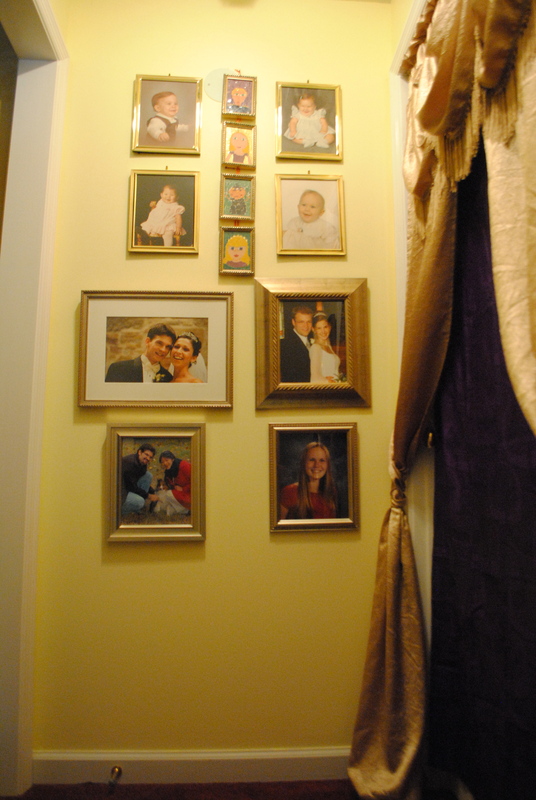 I like this wall–baby pictures with the kids’ mosaic self-portraits made in homeschool and finally their wedding (or single hood) photos. It will be fun for the grandkids to see their parents as they head into Narnia. The placement of the wall is particularly appropriate, right next to Aslan’s Tent (the parents’ bedroom). While looking for light-blocking curtains at WalMart the other day, I found these and thought they might go in Spare Oom. When I opened the package, the festoons of crinkly fabric and fringe cried, “Aslan’s Tent” as clear as day! I think they are perfect across the doorway as a hint to the extravagance inside. I finished the walls of Aslan’s Tent some time ago, but just got around to taking pictures. After all the methods I researched for hanging fabric, the one I finally used was ridiculously simple: I put knots in rough hay twine and used upholstery tacks to “nail” the twine to the wall, then draped the fabric over the twine. The “hairiness” of the twine helps hold the fabric in place, and the twine doesn’t stretch at all so there’s little sagging. And my method is TONS cheaper than airplane cable! 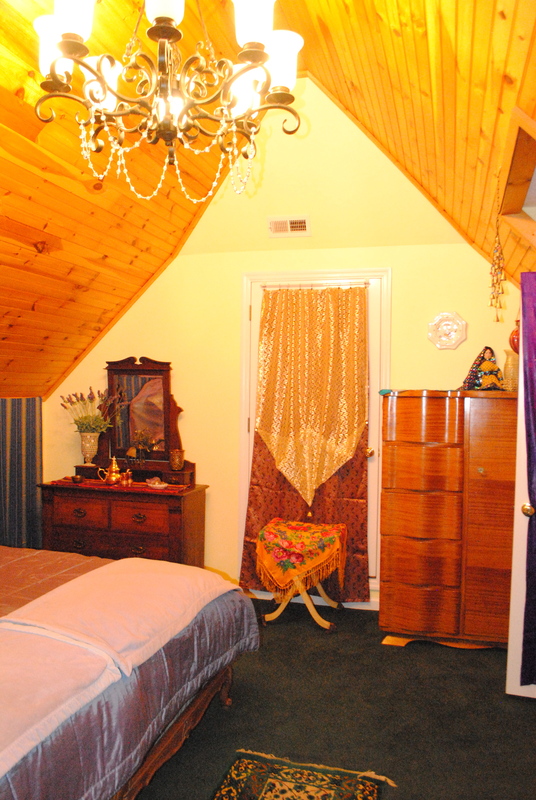 I covered the metal door to the attic in a piece of red brocade Moroccan fabric and a yard of gold lace. 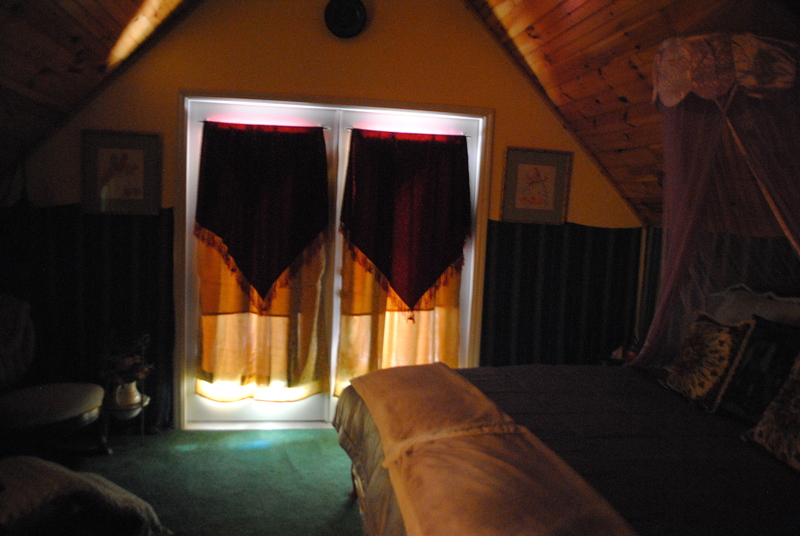 Thanks to a metal cafe rod and cafe rod clips, these are no-sew curtains, the best kind! We finally got the armoire moved up, so guests have plenty of room to move in. On the opposite side of the room, the same colors in an opposite arrangement drape the glass doors to the balcony with more no-sew curtains. A batik reminiscent of “A Horse and His Boy” hangs beside the chairs. I bought this for Herb in Africa in 1985, and it’s been waiting for the perfect spot ever since it left his office there! 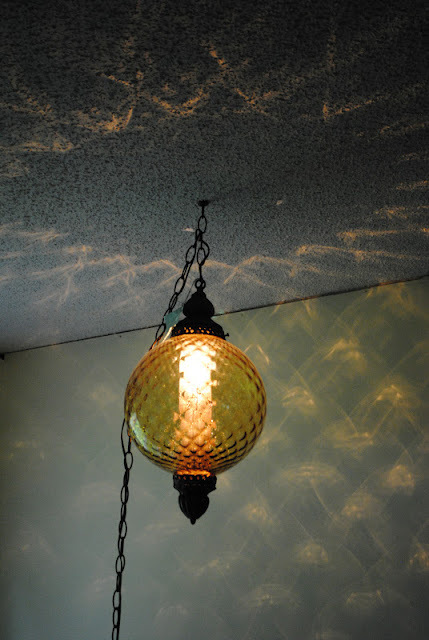 The Moroccan curtains are there for a purpose–to hide the ugly brown room-darkening curtains. As you can see, they do a pretty good job. 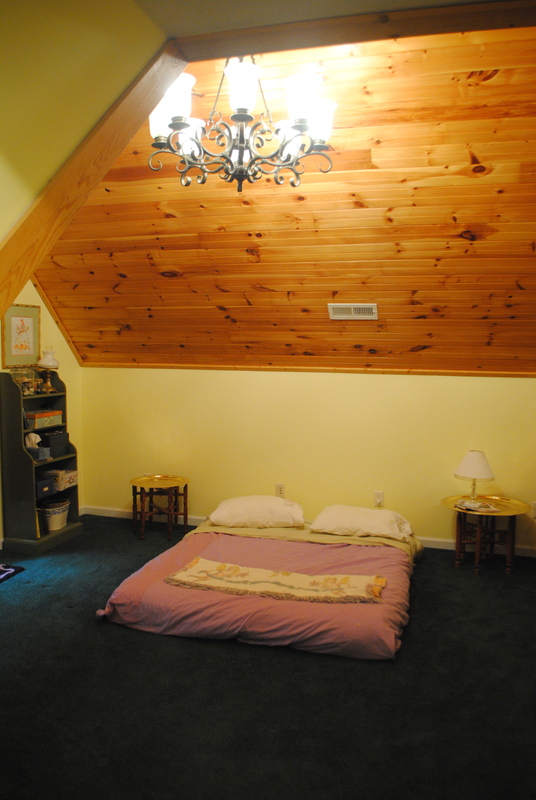 This is a great place for parents to sleep late while Didi and Mimi feed the kids breakfast downstairs. I took my hang-ups over into the Cair Paravel Library, too. 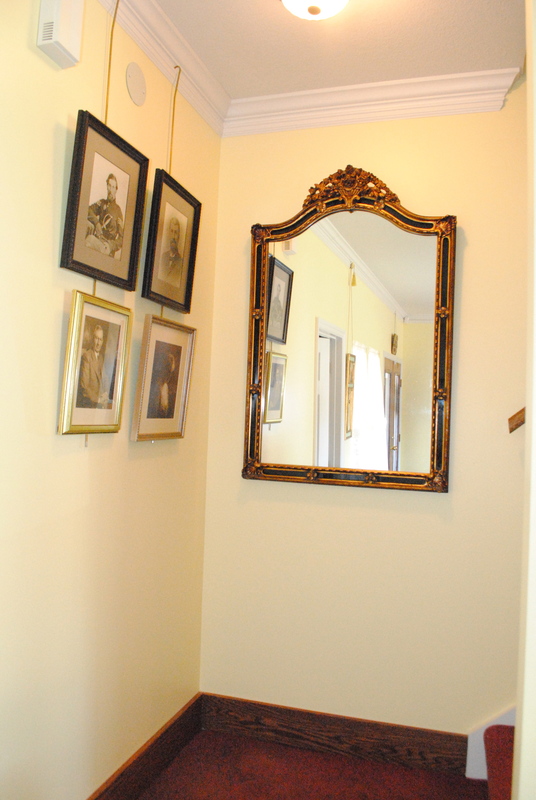 A large ornate mirror throws back light that comes through the stained glass door. Next to it are two brass-rubbings I did in London many years ago, never thinking that Queen Anne Boleyn and St. George killing the dragon would bring a Narnian flavor to my decor. I’m probably the only one that knows they aren’t a King and Queen of Narnia! 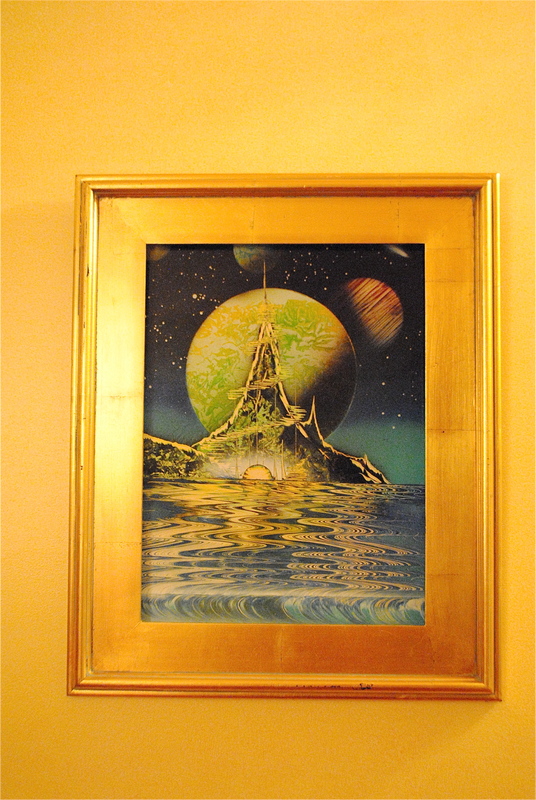 About 15 years ago, I bought this painting from a street artist in Aix-en-Provence. We watched him do it entirely with spray paint. (Check out Urban Wallart for more things you can do with spray paint.) We gave it to my brother-in-law, a science fiction fan, because it was a science fiction subject. Some years later when he didn’t want it anymore, my sister sent it back to me, and I’m so glad she did! Kara and I think it looks just like the castle of Cair Paravel by the sea–and I think the sea looks like it’s about to spill over the frame into the room. I found the big gold frame for $7 at Unclaimed Baggage, and it was a perfect fit. I love serendipitous surprises like that! The Lodge got some attention, too. 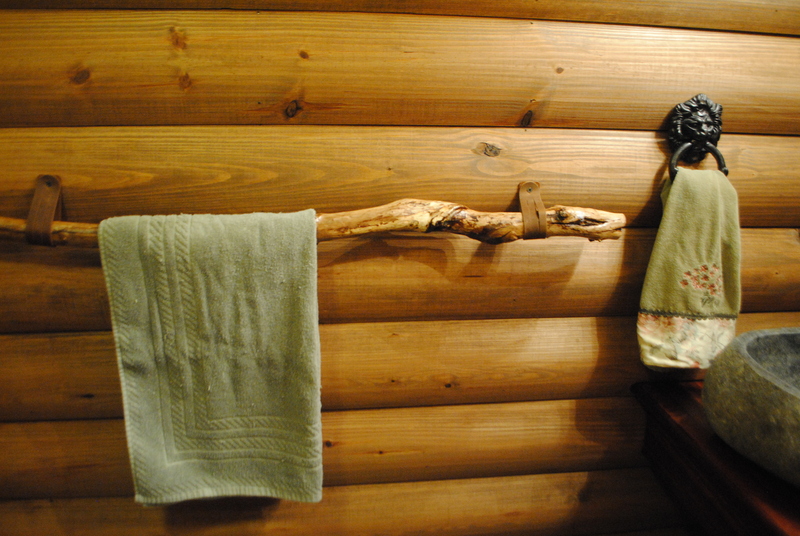 While I was in Dallas I was near a Hobby Lobby (as opposed to being an hour away here), and I found some leather bracelet kits which work perfectly to hang my special walking stick towel bar. What does it look like to you? This is a very nice dragon, and he’s perfectly willing to hold the bathmat. I won’t have any mean dragons in our Narnia! It’s a hang-up of mine! 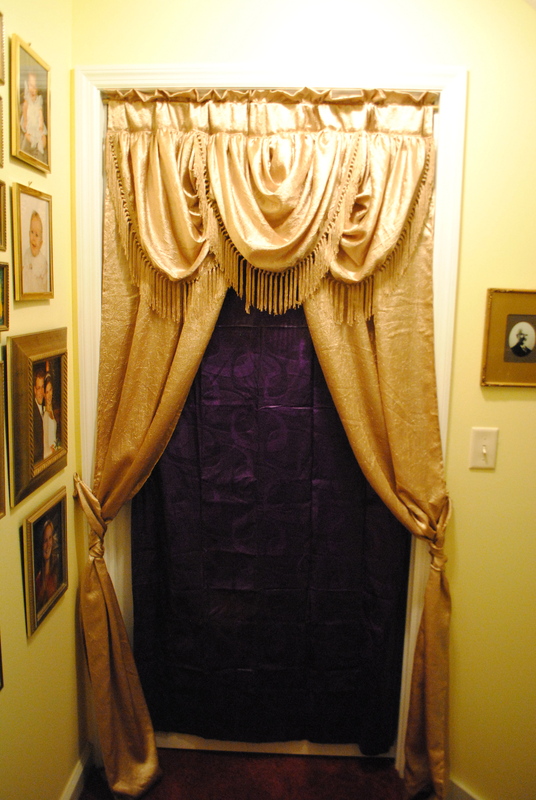 Here’s a glimpse upstairs after I finished getting Narnia ready for the first Royal Visit by the Grandkids. Aslan’s Tent is the parents’ bedroom. As you climb the red-carpeted stairs, Aslan’s Tent is on the right, across the hall from Cair Paravel. 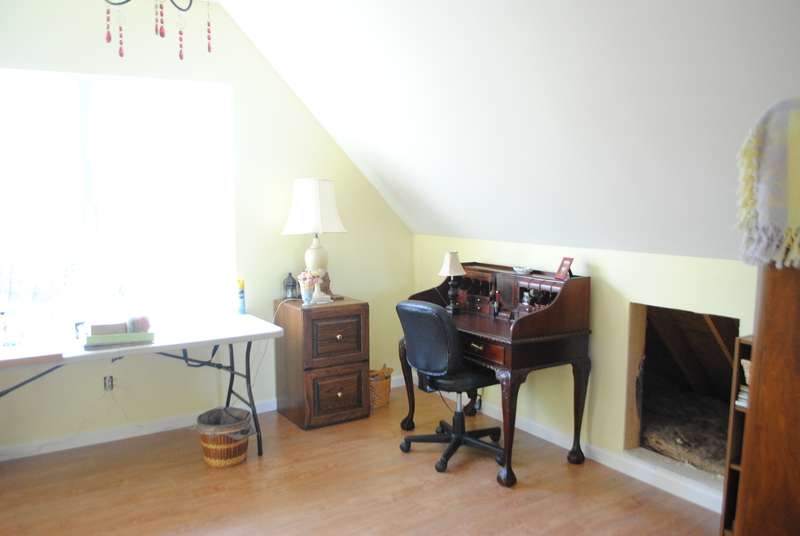 It’s the only room that already existed upstairs. 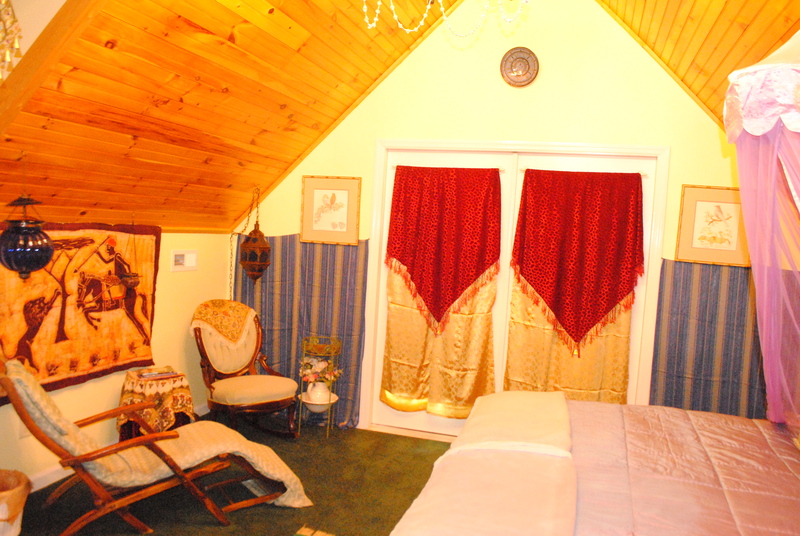 There’s room for a sitting area in the corner of Aslan’s Tent near the French doors to the balcony. 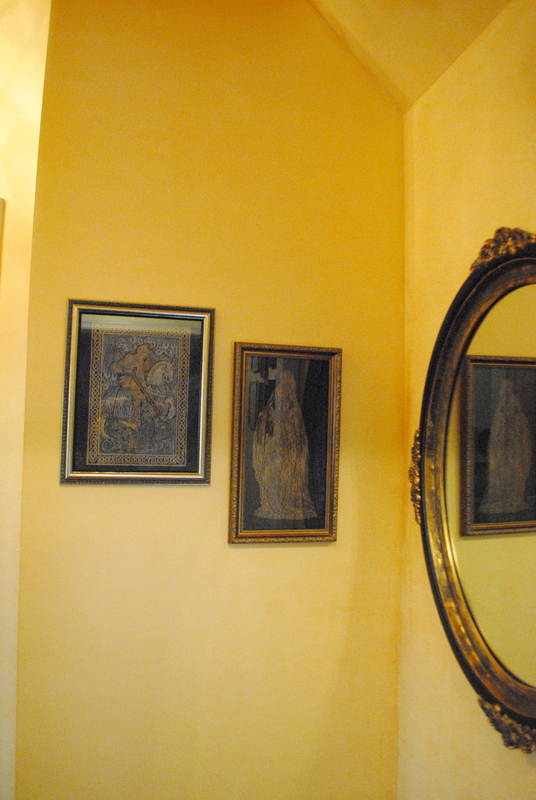 (The large mirror is only here temporarily.) I have plans to make Aslan’s Tent more Rococo-Morocco, but all in good time. Step across the hall into Cair Paravel, soon to become the Library. The doorway at left leads to The Lodge; the one on the right, to the landing between Cair Paravel and Aslan’s Tent. The other side of Cair Paravel will soon hold bookcases, and the reading area will move over next to the Wardrobe. The stained glass door that leads into Spare Oom contributes to the castle ambience of Cair Paravel. 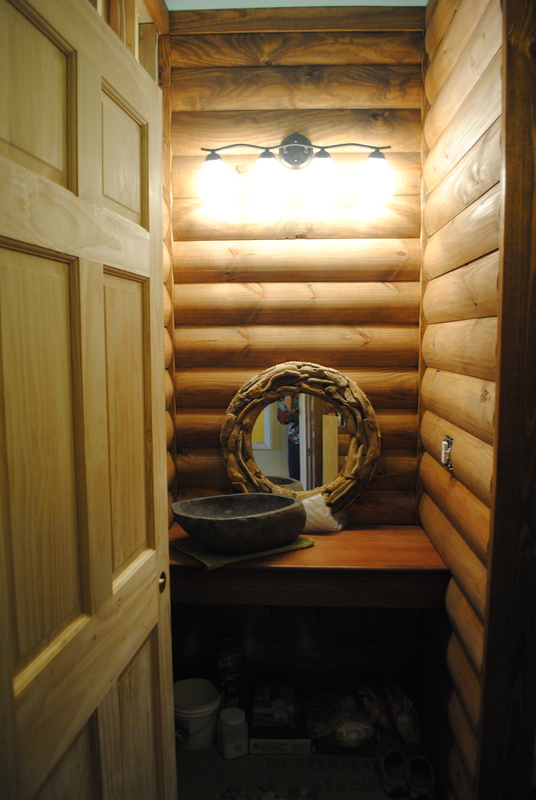 Let’s peek into The Lodge as we call the bathroom (in honor of the furry friends who led the Pevensies to Aslan). I was delighted to find this Amish-made towel tree in a local furniture shop. I was also excited to find the Bed, Bath & Beyond shower curtain that ties in the colors of the river rock floor, the Brazilian cherry vanity, and the log walls. Who knew furnishing a bathroom could be so much fun? Every bathroom in our house has to be set up for reading, so an antique hook and a Victorian-era hanger were pressed into service as a magazine rack. 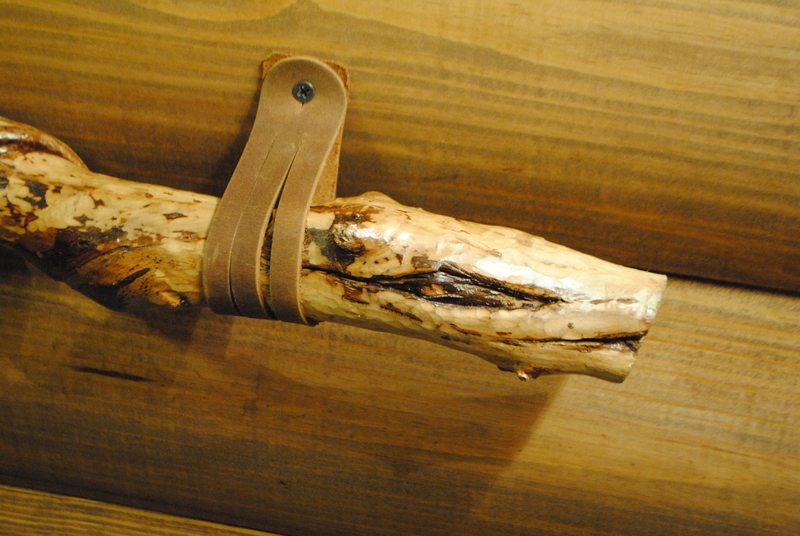 I had fun making this toilet paper holder from: a lion’s head pull I spray-painted bronze; a key chain ring; a piece of leather rein; a curtain rod hook; and a piece of an old broomstick that Herb cut down for me. The rein is permanently screwed to the dowel on the right while the curtain rod hook fits through an existing hole in the rein for changing rolls of TP. 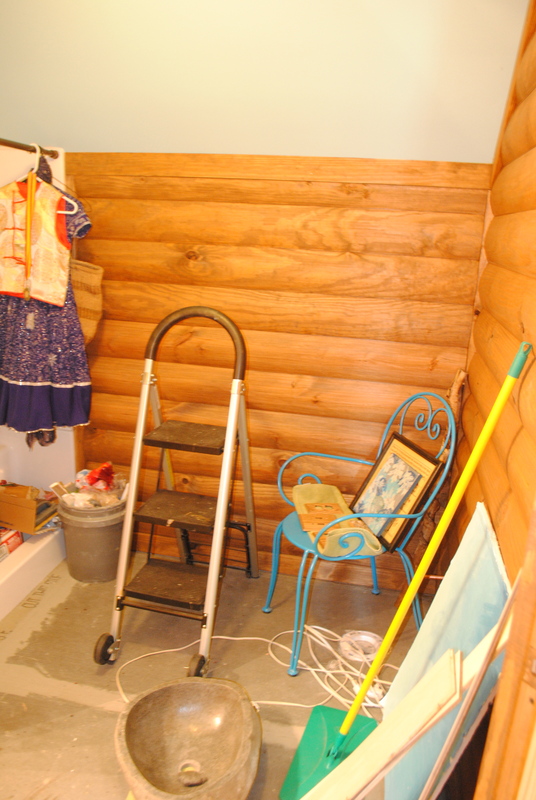 Let’s take a quick peek into Spare Oom as we call my craft room. It’s a great place to read by a window with a view or to stick an extra guest, as long as they don’t mind a crafty mess! And finally–on to Narnia proper! Aslan waits beside the miniature Christmas tree Kara decorated as a gift for her niece and nephew. The berths on the boys’ side have fur throws for blankets and red velour spreads which can double as dress-up capes. The dress-up capes on the girls’ side are purple. As we turn out the lights, all is ready for the arrival of Charis and Kol, Daughter of Eve and Son of Adam, Queen and King of Narnia. Although I was still sick in bed last week, I could use the telephone! 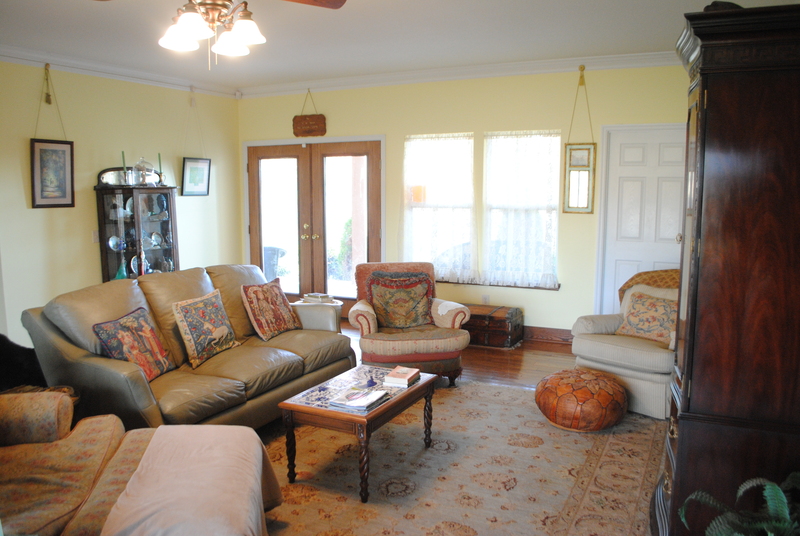 I went surfing through the Yellow Pages and discovered that my favorite local cleaner for Oriental rugs, Interior Care, Inc., also does carpets. A few days later a young man was here to clean the ferret-stained, dust-choked Aslan’s Tent along with a well-lived-in chair in the living room. Herb and I had gotten the furniture out so every square inch of the carpet is now as clean and good as new. Yesterday, poor Herb had a busy Sunday doing all the things I had (graciously) consented could wait till the weekend so he could study for his finals and write his papers. The thing about “Honey-Do” lists is they just don’t go away quietly! First he got the plywood cut at Lowe’s for the Dawn Treader berths and carried all four very heavy pieces upstairs. Halfway through, his foot slipped on the stairs, the plywood shot backwards down the stairs, and Herb went bounding stiff-legged after it, still hanging on. He jammed his ankle, poor guy, and was limping badly by bedtime, but it’s “pretty good” this morning. 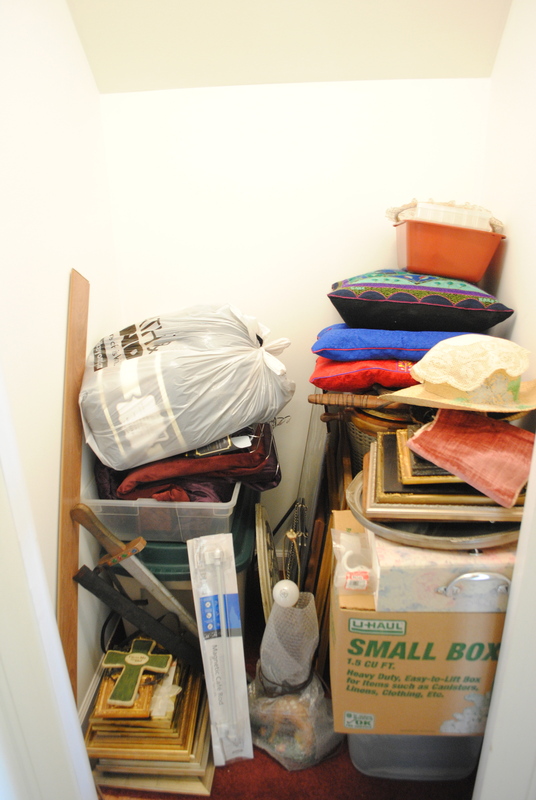 After the plywood was ensconced in a berth (because once the Wardrobe is in place, we’d never get it in there! ), Herb started moving furniture. I helped him move the dresser in, and he brought the antique twin beds from storage at Kara’s house and set them up. Next, he brought the daybed over from storage in Kara’s house, and we set it up together. The rest of Spare Oom is a wreck, but now I can figure out where to move the rest of the furniture and then start putting the room together. Bit by bit it’ll get done. This morning I began to feel a tiny bit human again, so I started on decorating Aslan’s Tent. Obviously, we need a king-sized mattress so this is just temporary. One thing I did do from bed with my wonderful iPad was research king bed sizes to learn that the base provided by our two twin box springs will perfectly fit a regular king. I’m not buying a mattress online; I’ll let my “fingers do the walking” to find out where I want to try out and buy a mattress. The quilt is one Kara doesn’t use any more; we brought the bedside table back from Morocco along with the mint tea pot; and we bought the pink tea glasses in the Arab Quarter of Marseilles before we left France in 2001. For now I’m leaving the silk screen prints made by two of our once-little girls and the beautiful garland handmade by a friend, although I’ll switch to Moroccan fabrics on the door. 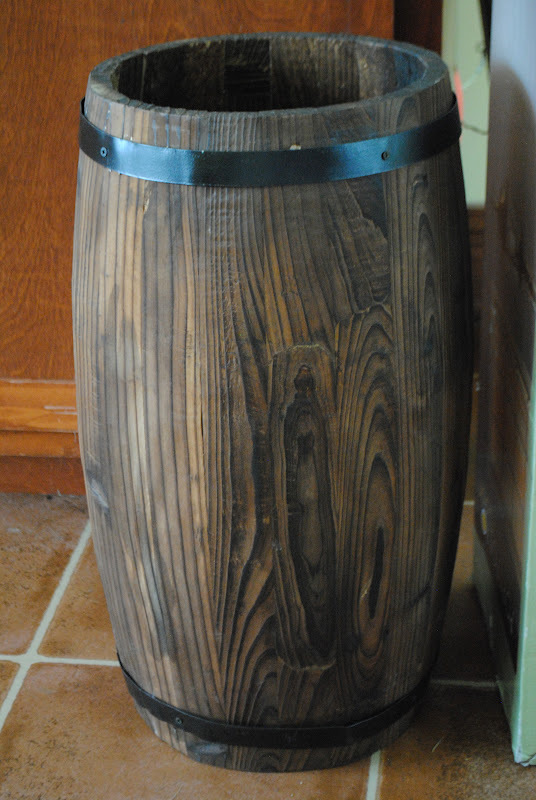 This larger bedside table is Moroccan, too, although I bought it for a song in an antique shop. Both the tables were beautifully polished by High Point Antiques in Chattanooga. Next, I’ll take them this little leather Moroccan lamp (a gift from our kids) to repair the curlicue that got knocked off. This really IS the fun part! I love decorating! 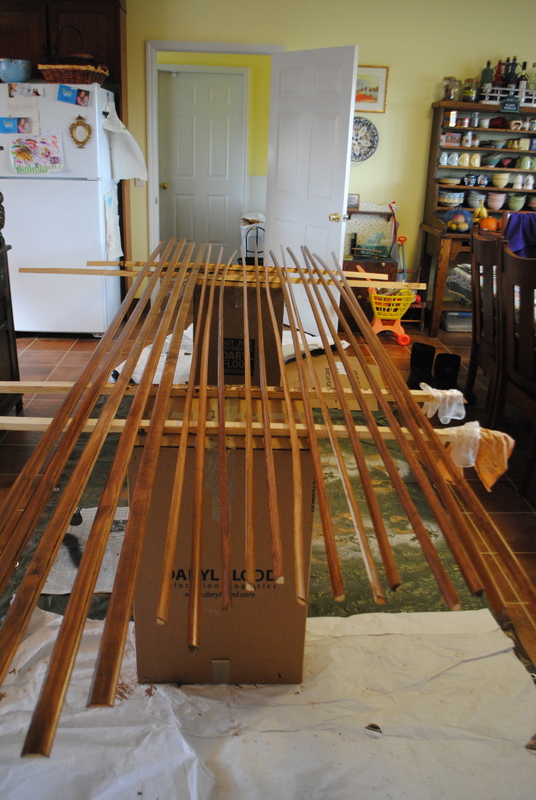 During the week of Nov. 5-9, I ran myself ragged trying to stain and poly the wood for the beam in Cair Paravel and the baseboards and berth trim in Narnia before Ben was ready to install it all. In addition I was trying to stain the bathroom walls and door before he put the river rock tile down. When I learned at the end of that week that the river rock tile (paid for and supposedly ordered more than two weeks earlier) had not arrived, it seemed at first like a blessing. It meant I was able to finish the bathroom walls without trying to keep the stain off the river rock tile. 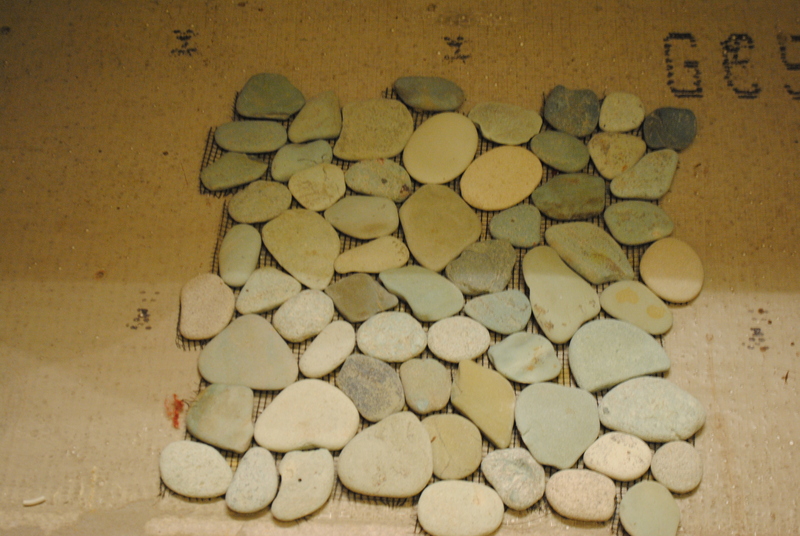 In fact, those pretty little pebbles caused a glitch that gummed up the whole works. On Monday, November 12, I got a call that the tile had arrived. Jon was here to finish painting, and I thought Ben would arrive soon to finish the trim (so Jon could finish caulking and painting) and install the tile. Unfortunately, Stuart called to say he had picked up the river rock, but they was busy elsewhere and couldn’t make it back. 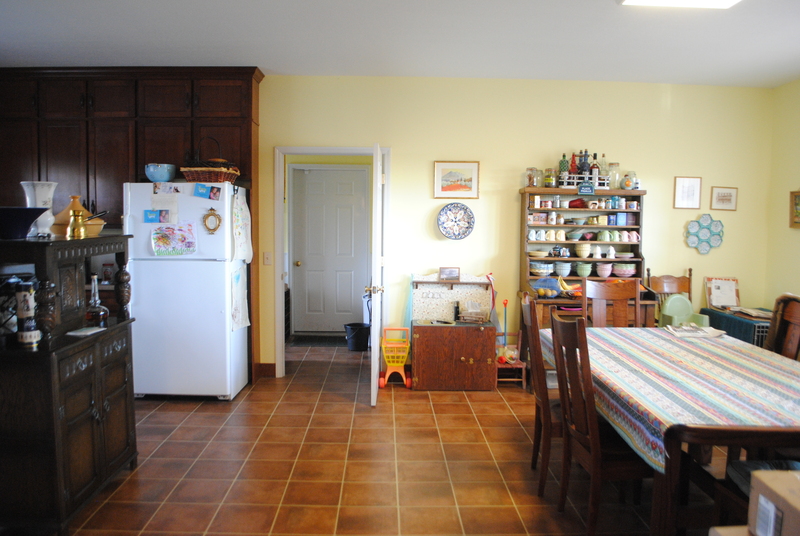 No trim, no tile, no plumbing, no final inspection, no Jon finishing painting. Everything came to a screeching halt. Jon’s daughter Becky put a coat of yellow over most of the primer in Mimi’s Cave while Jon glazed the ceiling in Cair Paravel, but he wasn’t at all happy with it. Even mixed half-and-half with clear glaze to slow the drying time, the Valspar Metal & Patina Glaze rolled onto the ceiling very patchily. I should have taken a photo, but I had gotten sick on Sunday and was so miserable I couldn’t be bothered. THAT is pretty sick, when I can’t summon the energy to care about Narnia! Finally Jon suggested he try wiping the glaze off. Although some of it had dried a bit more than others, I liked the look better. I know Jon still wasn’t satisfied, but Kara and I think that touching up a few areas will make it look perfect, especially with the way the leafy pattern of the light hits it. In going back to read the directions for the glaze, I realize it is never suggested to simply roll it on. This seems to be one place where my “sample board system” failed. It rolled on fine on a 2′ x 2′ sample board, but it was a different matter trying to roll repeated sections on a large surface–especially overhead on (I hate to say it) not the best sheetrock job I’ve ever seen on a ceiling. 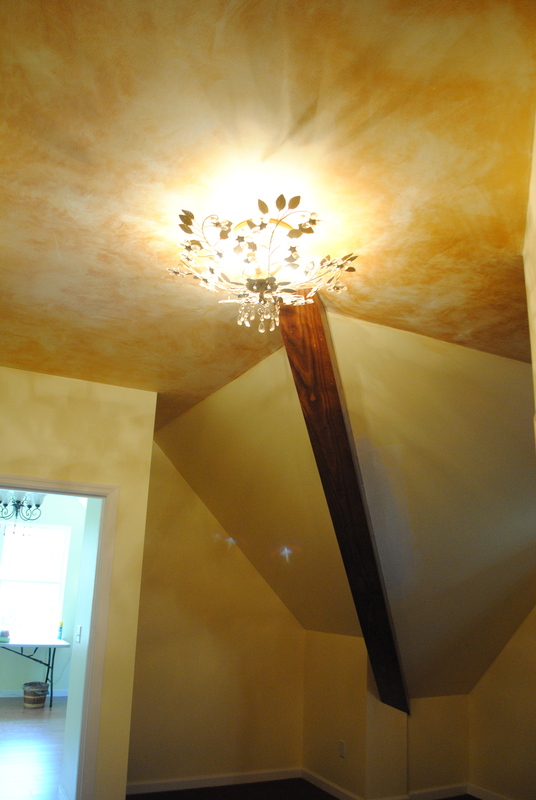 All Valspar’s suggested techniques are either additive or subtractive; in other words, wipe on or wipe off. I’m sure that will be the clue to making the walls look great. I had expressed to Stuart my concern that by not getting tile and plumbing, we weren’t able to use our space at all due to restrictions in the Building Permit that forbid putting any furniture in or using the space at all until after the Final Inspection. On Friday Stuart called with some good news: He had talked to the building inspector and received a “temporary, provisional, verbal approval” for us to use the space, assuming we trust Stuart to come back and finish it. Yes, of course we do! So that was the good news . . . The bad news was that the future guest bedroom (Aslan’s Tent) looked like this PLUS, covering any green carpet that showed, a box spring, numerous cans of paint and bags of supplies from Lowe’s and Ace. 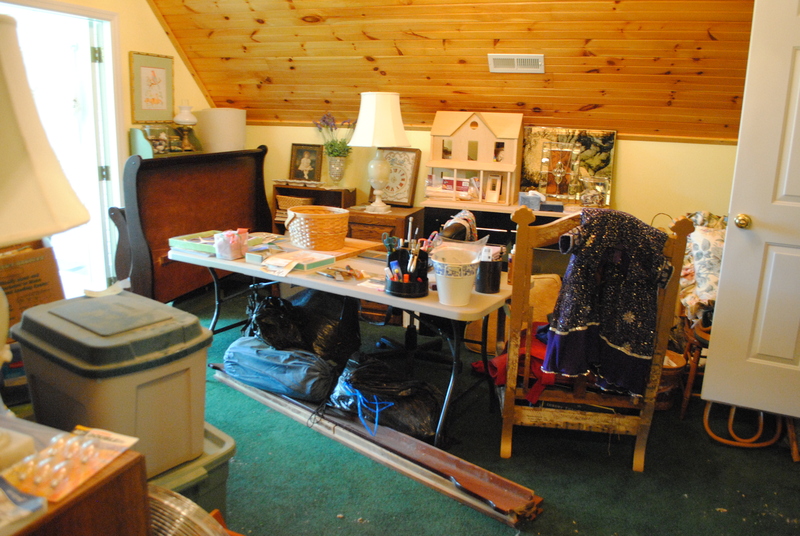 In short, it looked like a hoarder’s house with absolutely no passage through! Kara has been sick, too, but with company arriving Sunday night, we rallied our befuddled heads and wobbly limbs and set to work. Herb furnished the manpower to move furniture, but Kara and I made every single object disappear into an appropriate and somewhat less visible space. A heroic effort, if I do say so, myself! We stacked craft supplies and Narnia decor in the closet of Mimi’s Cave which Kara has nicknamed “Spare Oom” as being a more Narnian name! Several plastic bins of fabric and two air mattresses got tucked into what’s left of the attic. 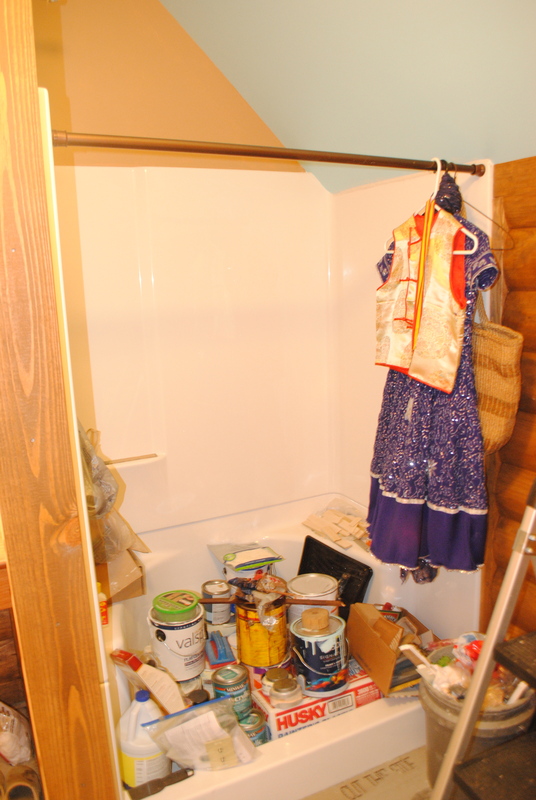 Everything paint and stain-related went into the shower because it can stay there till after the floor is done–accessible, but out of the way. You can tell we got tired at the end and stuffed a few hard-to-place items in the bathroom corner! No wonder we were tired, such busy sick little rodents! By late afternoon, Spare Oom was actually functional. By Saturday evening, Aslan’s Tent was functional. Just ignore the stained glass door leaning there for safe-keeping and think of it as a large decoration! 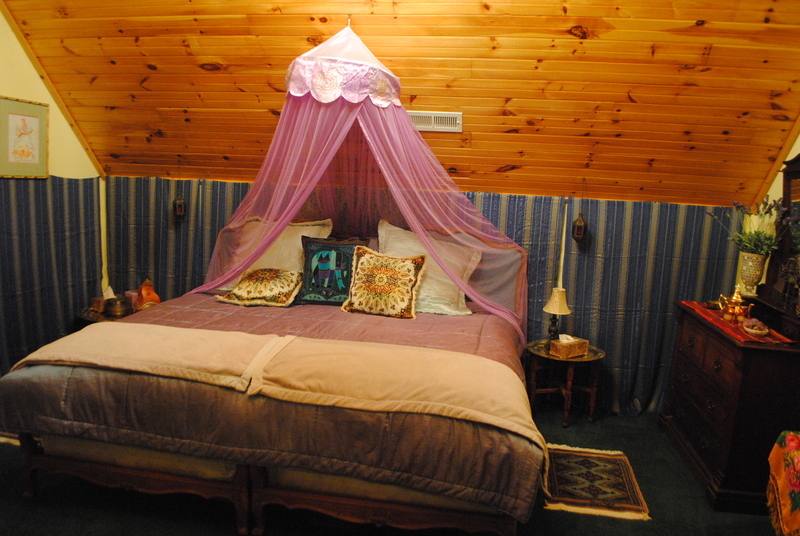 It’s not quite up to our usual guest room standards, but at least it’s clean! 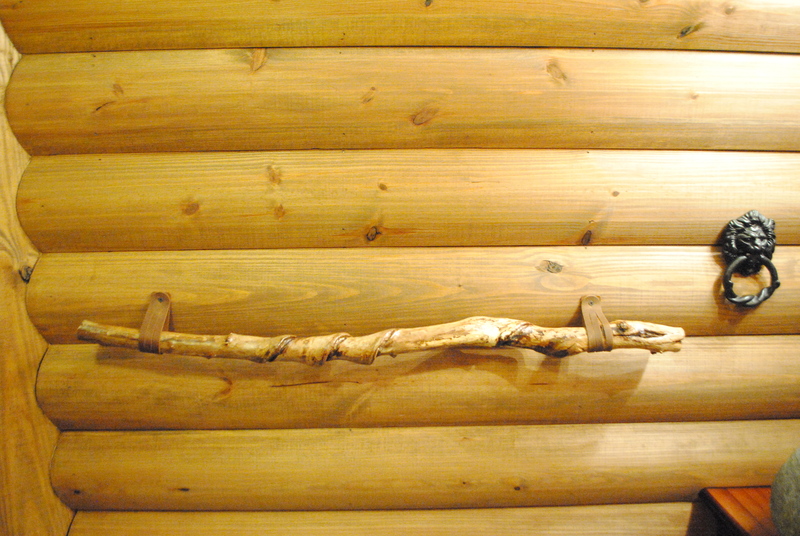 Guests still have to go downstairs for the bathroom, but The Lodge hints at what it will offer once our works get un-gummed-up and everything gets finished. Thanks to Herb’s cleaning and more organizing on my part, by Sunday afternoon we had the kitchen devoid of every sign it had ever been an atelier. The living room was free of construction dust for the first time in a couple of weeks, inviting us to sit and enjoy a rerun of “Breaking Dawn, Part I” on Netflix before we go see Part II tonight. The bad news (wait, didn’t we already have that?) is that Stuart is highly doubtful they will be back here to work at all this week, either. I guess the silver lining to that is, I have another whole week to make up for being sick. Once all the Thanksgiving cooking is done, there’s plenty of poly-ing to do on the Dawn Treader berths and a throne waiting in Spare Oom for it’s upholstery to be finished. So I guess the Red Carpet for our guests will have to be Drop Cloth Carpet for a little while longer. At any rate, something’s looking up: When Kara told me today that she thinks I need a curtain for each of the Dawn Treader berths, I said, “Hmm, we could cut up drop cloths. They’re kind of like sail canvas!” My Narnia-Sense is working again–I must be getting better! Hospitality is something of a lost art, but we try to keep it alive by rolling out the red carpet for our guests, especially our kids and grandkids! We chose Shaw’s Passageway III (the best grade) in Faded Brick for the hallway because it’s the Library at Cair Paravel, and the rich red color seemed royally suited. 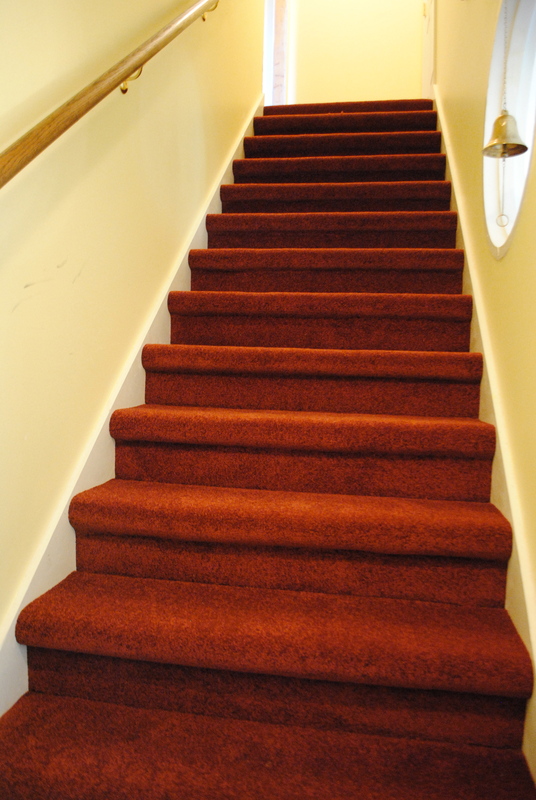 It’s just icing on the cake that it conjures up the idea of red carpet treatment. 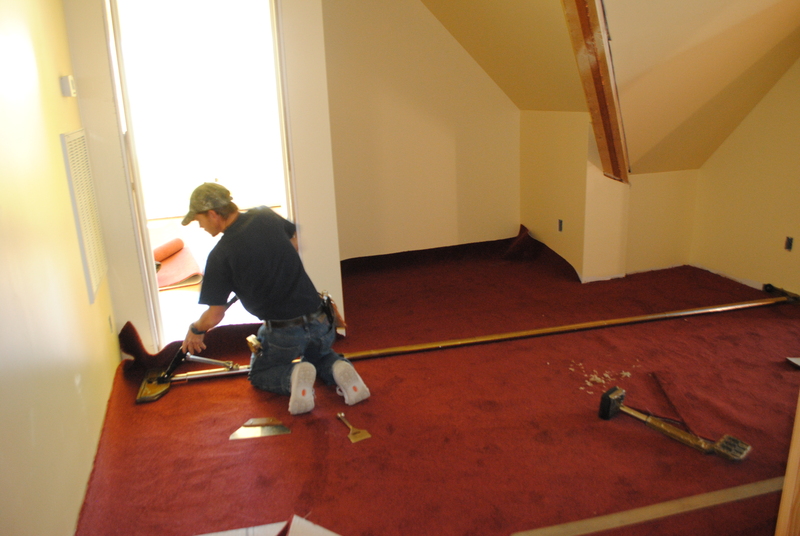 Ken and Tony were back this morning to lay the carpet. It was fascinating to watch. 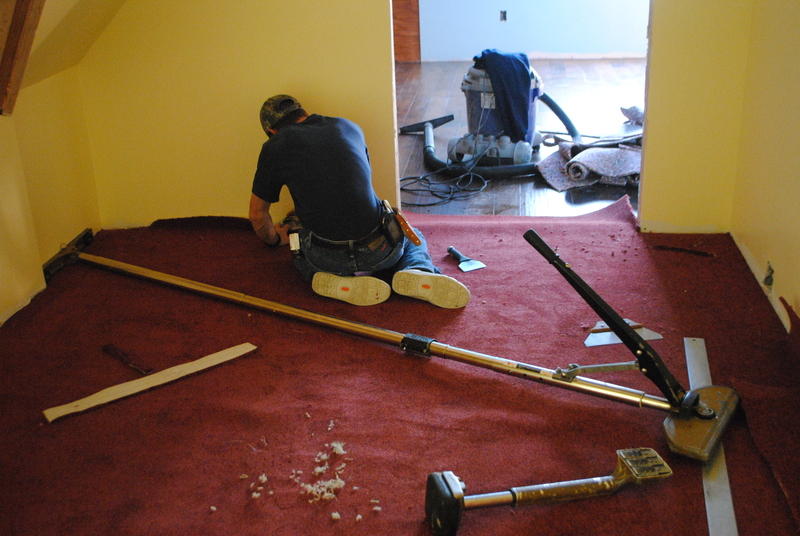 That long tool that goes clear across the hall is something they use to stretch the carpet. I’m going to call it a Carpet Dragon! The left hand (tail) end braces against the wall and can also swivel to let the business end (or head, at right) move along the wall. Here it is in action. Tony adjusted the long metal bar, braced the tail end against the wall, pushed the teeth (they’re in the head) into the pile of the carpet, and then he pushed down on the lever-like handle. This pushed the carpet (held by the teeth) towards the wall at left. 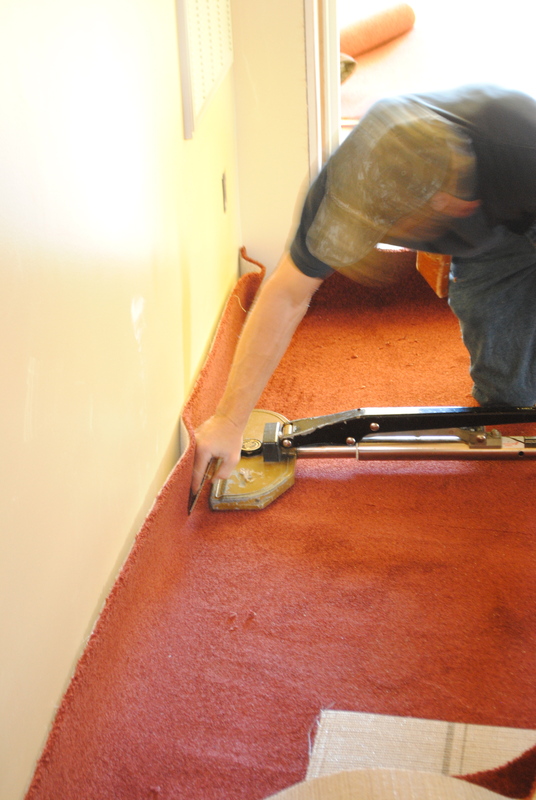 While the Carpet Dragon held the carpet in place, Tony used a tool that is much like a sturdy spackling blade to push the carpet right down against the wall and into the strip of carpet tacks. The final step was cutting off the excess and using the blade to push stray fibers down in place. 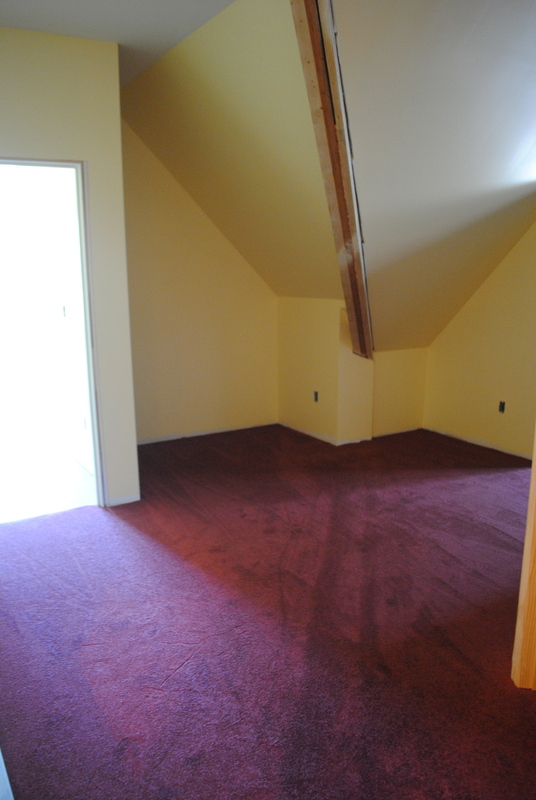 The end result is a nicely laid carpet that Tony promised won’t wrinkle like our downstairs carpet did. This photo makes the carpet look a little more plum-colored than it really is, just as the previous ones make it look more rosy. The first photo is probably the most accurate, color-wise. While Tony was busy upstairs, Ken was busy on the stairs. 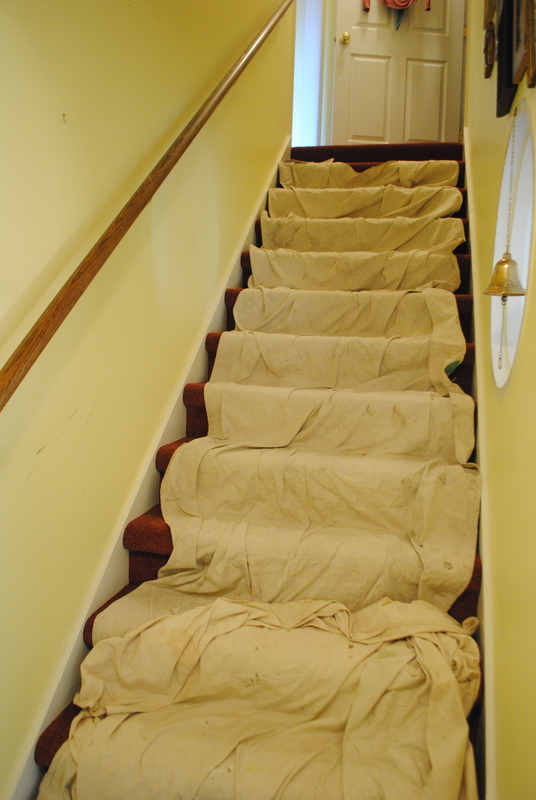 They probably took almost as much time as laying the whole upstairs hall, but they look beautiful, too. 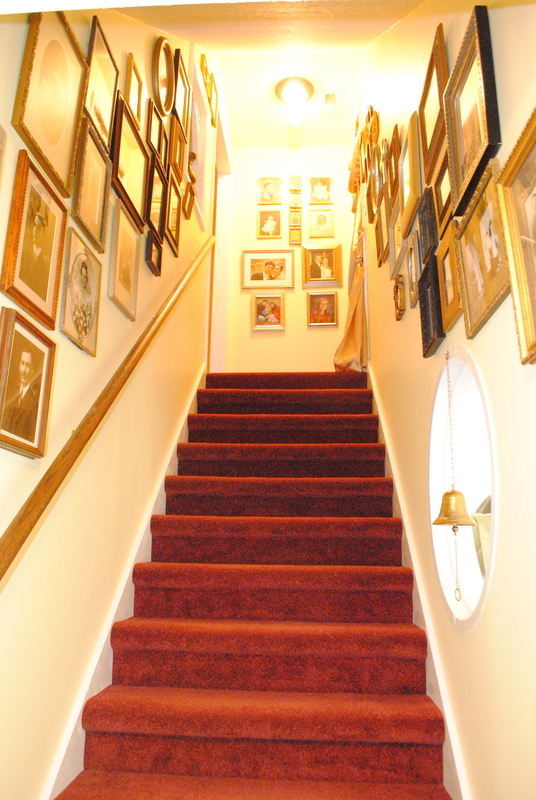 Oh, by the way, the carpet on the landing looks great when seen from the living room. It’s one of the accent colors in our living room, but I was vacillating a lot about going with something so . . . intense. Kara assured me it would look great, and she was right! In my last post about the plans for Narnia, our best-laid plans had, indeed, to quote Robert Burns “gang aft agley.” (wiki-translation: gone often awry) Well, they’d twice gone awry, and so we asked Stuart Bickley, our contractor, to come meet with us one more time on Thursday afternoon. He wasn’t put out because, as he pointed out, it’s much better to confer about what we should do on this end than in the middle of construction! We went over his figures together, and what finally became clear was that Plan Two was going to come very close in cost to Plan One. Yes, the LVLs in Plan One cost more, but the skylights in Plan Two ended up costing almost as much by the time installation and labor were included. We then trooped upstairs, along with Kara, to take a look at the attic. As we discussed pros and cons of the two plans, Kara put her two cents in. She told Stuart her idea of combining the two plans, and he instantly caught on to the advantages of it. A huge one was not having to install the tricky LVLs in the middle of a bathroom with plumbing and shower height to consider. And here I must confess that Kara was right all along! Of course, my objection to her idea originally was that we would still have to cut rafters and install LVLs, but now that we knew that wasn’t more costly, my objection evaporated. We all got on board with The Plan and began to get excited. Houston, we have ignition! I spent the rest of the evening cutting, pasting, whiting out, measuring and re-drawing lines until FINALLY we had a Plan! The office will become my craft room. In fact, we spent Saturday moving most of my stuff in. I’ll be working at it bit by bit, but I’m excited to have a place where I can go make a creative mess and not bother anyone! Zephyr has already adopted it and loves to follow me up there. The rest of the plan is pretty self-explanatory except perhaps the shelves in the open area of the hall. 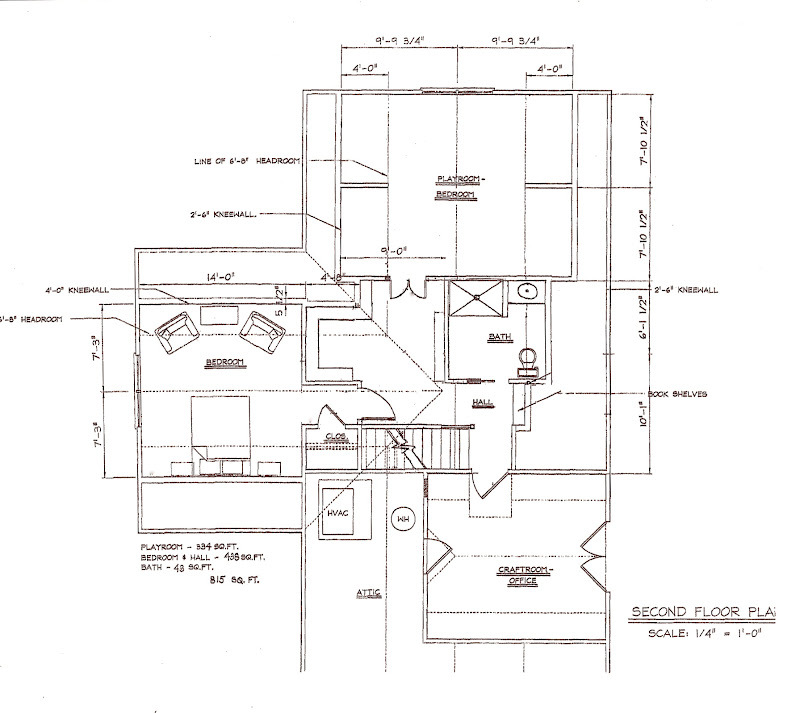 What we actually end up building in will depend on how the head room works out there. We all agreed there are just some things we’ll have to wait and see about . . .
Friday I went to the county Planning Office and began the Permit process. I was then sent a few steps down the hall to the state Environmental Office where they could not find a plan on file for our septic system. (Mr. Blevins, our septic expert, says that’s no surprise!) When I stabbed my finger in the Yellow Pages (actually, I looked to see who had the biggest ad), I lucked out by choosing Blevins Septic because they know and like him at Environmental, and that’s going to make things much easier. So bright and early Tuesday morning, Blevins will be here to uncover the tank for the Environmental inspector later that morning; they’ll pump the tank at the same time. We’ve lived here four years, and the guy that lived here for three years before had no idea when it was last pumped. Seeing as it should be done every five years according to Mr. Blevins, I’d say it’s about time! And if all goes well, Stuart could be here to begin work by late next week. All was not lost during our Molasses Period. To ease the frustration of w.a.i.t.i.n.g., I started digging through things I had packed away when we moved to this smaller house. My plastic storage bins were a treasure trove of Narnia-bilia! These two beautiful Korean floor cushions will be perfect on the Stone Table for someone to sit on and read. These cushions I bought years ago at Southeastern Salvage fit into the Moroccan-Run-Amok theme of Aslan’s Tent. I kind of like the poetic sound of that, but we could also call the theme Bazaar Style, a term I recently encountered in a decorating book. I was VERY excited when I found this batik we bought in the Central African Republic in 1985. It looks exactly like a scene from “The Horse and His Boy” except Shasta never went after Aslan with a spear–he was too terrified! I have lots of Moroccan shawls and pieces of fabric collected from our travels to Spain and Morocco as well as from the Arab Quarter in Marseille when we lived in the south of France. If anyone wants to visit North Africa without actually going there, Marseille’s Arab Quarter makes a good substitute–minus the camels!! To celebrate our anniversary late in June, I told Herb that one thing I wanted to do was go to Unclaimed Baggage in Scottsboro, AL. There I found the perfect little Eustace-dragon. These enormous lengths of brightly colored pieced fabric were a steal at $6 apiece at Unclaimed Baggage. I’m planning to use them to help make the sides of Aslan’s Tent. The purple fabric and green rug fit right in. Kara has a satiny lavender comforter she doesn’t use any more, and it is made to order for this color scheme. “Just checking” at Lowes’ one day I found our perfect Lamppost. We’ll paint it black, as one of the online reviewers had done, and we think Aslan will feel right at home! During an earlier trip to Southeastern Salvage with Kara, we picked out the sink for The Lodge bathroom. We bought the dark bronze drain and waterfall faucet to go with it. It has a definite lodg-ish look to it! And I converted Kara to a Southeastern Salvage fan! Shortly after that we were bumming at Go Fish on the North Shore in Chattanooga and found this fabulous mirror to go above the sink. It would make any lodge-builder happy! I had thought of making one, but I can’t buy a plain mirror and make it for what this cost. The last treasure I found in a rare moment when I wasn’t even thinking about Narnia. I went into Tractor Supply with Didi one day, and there was our Lodge trash can, sitting right there! It looks like the inhabitants emptied a barrel of salted fish and turned it into a bathroom waste basket. This great old fishing basket I’ve hung onto for several years will encase a simple pendant light in The Lodge. 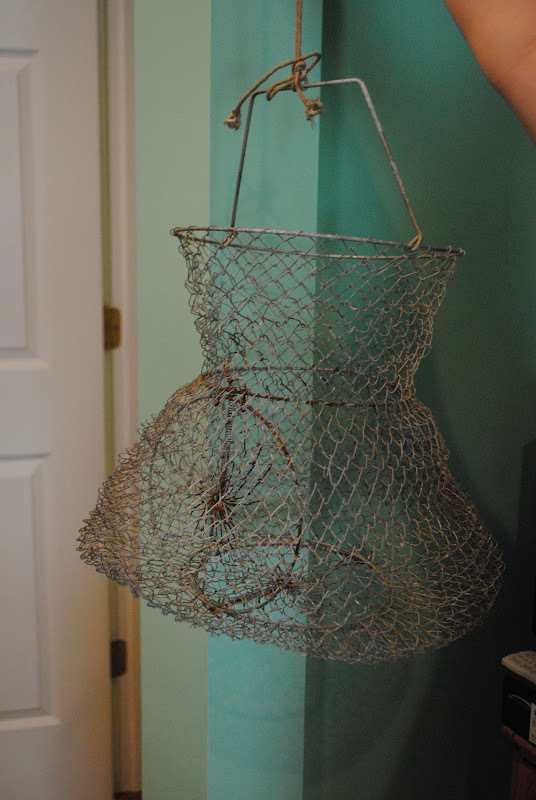 It will give the look of an expensive chicken-wire-covered light fixture I found online–and it’s an original! My plan for the ceiling treatment involves fish nets from Hobby Lobby with twigs and driftwood intertwined in the nets, then hung from the ceiling. At least, that’s the plan! Kara’s living room chandelier will look marvelous in Aslan’s Tent. I’m glad she has such excellent taste! Fortunately, I have a nice freebie we can hang for her in its place. Credit for the most brilliant (excuse the pun) lighting idea for Narnia goes to . . . KARA! 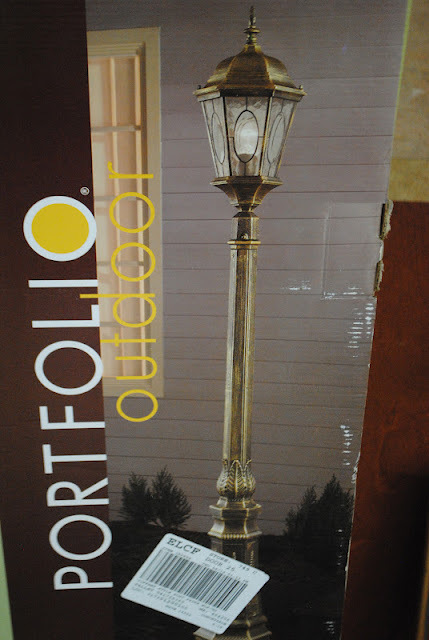 She originally offered us her fabulous 70’s “sun” lamp. 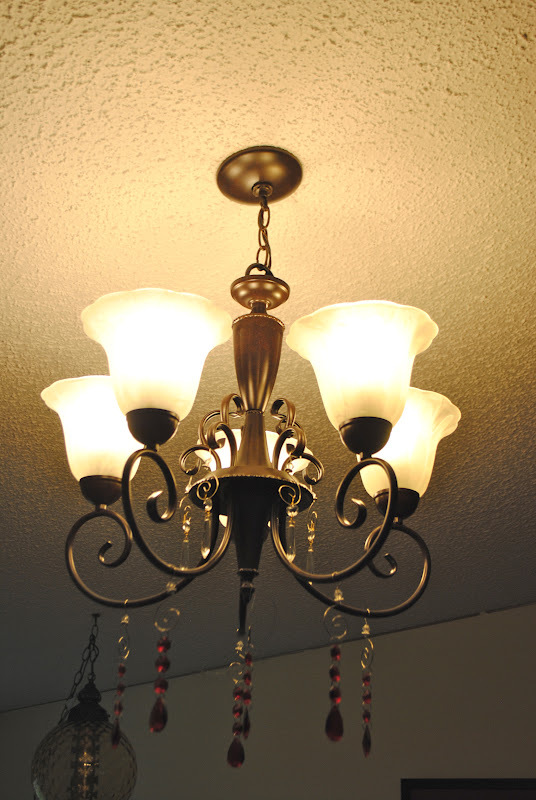 Then one day she called me from one of my favorite antiquing haunts, Knitting Mill Antiques, to say she’d found one just like it, except it was ready to hang as a chandelier. When I asked the dealer’s best price, he said $99, just what I had wished I could get it for. Since ours is sitting in a box, Kara’s will make a good stand-in. I can’t wait to see what kind of beautiful patterns the “sun” casts on the Narnian sky! I finally followed Kara’s advice, and on my way home one day I stopped at Lumber Liquidators. 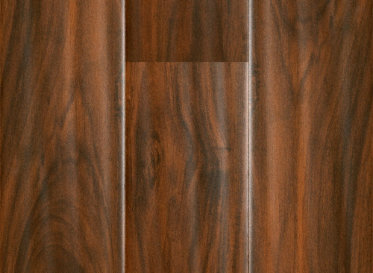 There I found a beautiful hand-scraped bamboo flooring that looks like it was taken from the “Dawn Treader’s” deck. It’s a good thing I didn’t actually buy it that day even though the sale was almost over (stay tuned to find out why), but even the regular price comes in under the flooring allowance Stuart’s estimate gives us. With such a deck underfoot, all we need is the rocking of the ship to make the GKs feel like they’re really on board with Prince Caspian . . . Never fear, I have a plan for that! We weren’t sure if we’d need to go into the front gable, so we put a ? on that part. Obviously we forgot to take head room into consideration! The place where we put the closet and bath would have no head room! Now you know why we needed an architect! 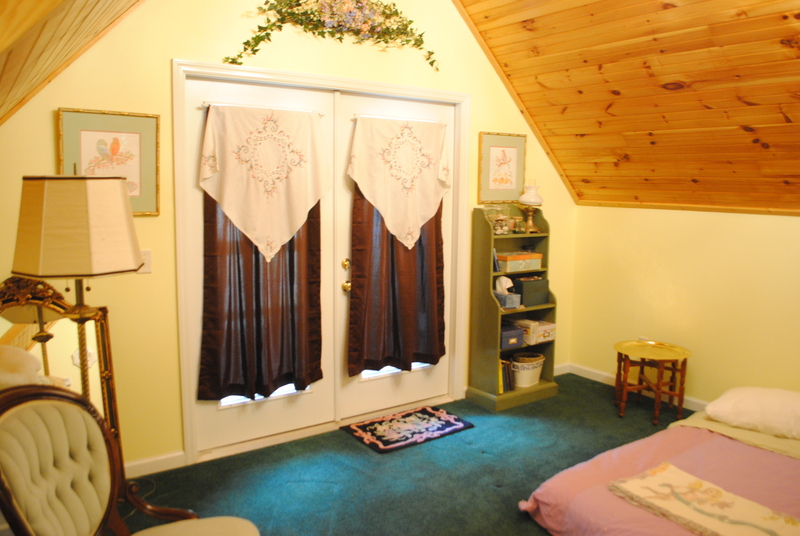 The Craft Room – The only existing room upstairs, on the right of the upper landing. With its vaulted bead-board pine ceiling and French doors opening onto a private balcony, it will make a marvelous craft room. Who would not feel creative in a place like this? Bath – The Lodge, it will be cozy and woodsy. After all, those infamous creatures’ houses are made of wood. I get very excited about anything wooden nowadays! Bedroom – The left hand bedroom will be Aslan’s Tent, a luxurious retreat for parents or guests in an Arabian-Nights-Gone-Wild decor. 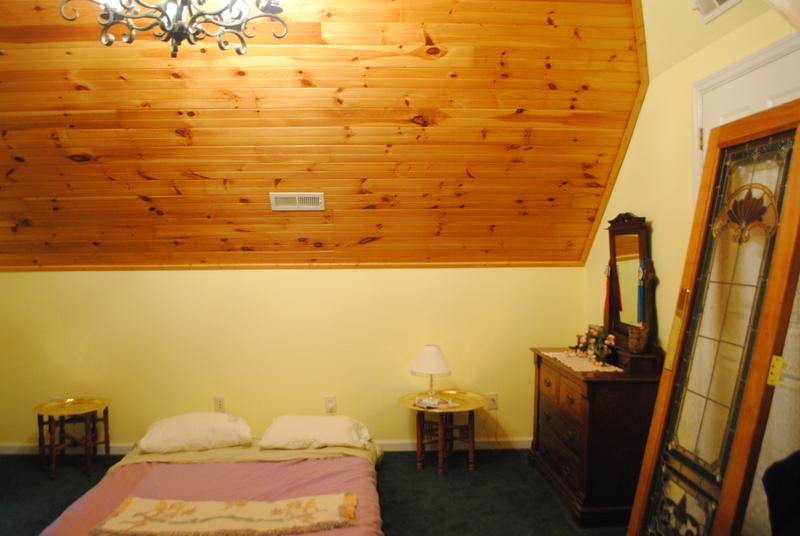 Bedroom – The bedroom closest to the library will be Narnia. As you come up the stairs and turn into the hall, you will be facing the wardrobe doors leading into Narnia. Each side of Narnia will have two ship-style berths tucked under the slanted ceiling–Kings on one side, Queens on the other! Beneath the window will be the Stone Table, made cosy with cushions and flanked by two thrones, a perfect spot for reading by the big window. NOTE to my married kids: Do not think this means we only want 4 grandkids! If you give us more, there’s always the attic at the other end of the house! By the beginning of July, I was quite discouraged. This project felt like swimming through molasses! After we got the plans from the architect, we asked two contractors for bids. That took a while what with summer vacations and such. Then one contractor wisely suggested that we need a structural engineer to look at the plans. It took about a week to make that happen. Even after he came, we still had to wait because his assistant had been on vacation and he had a two-week backlog. Sigh! We got another shock when the engineer’s recommendations came back. Cutting through the rafters to get into the front gable for Aslan’s Tent added a LOT of cost to the project. The plan, as it stood, involved some very funky valleys in the bathroom ceiling and serious support requirements like LVLs. Translated: $$$! 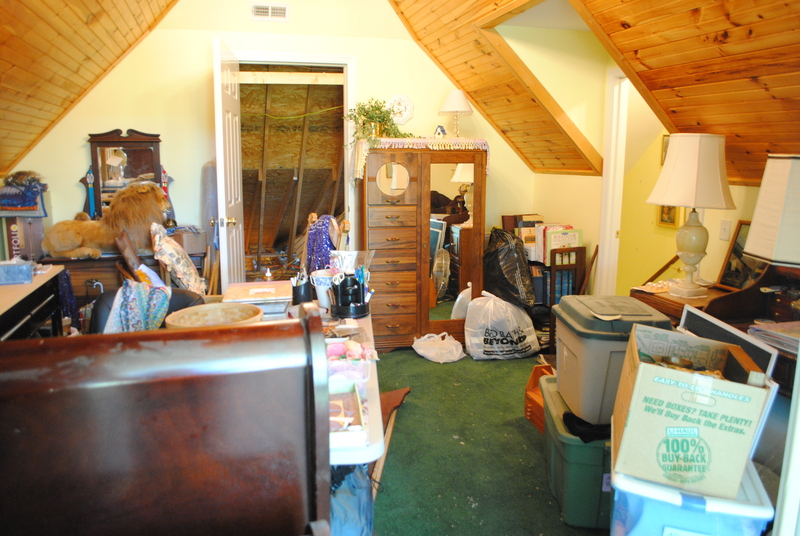 Ann did exactly what we asked her to do and gave us a room at the other end of the attic without cutting rafters. But Didi, Kara, and I felt a sense of loss when we looked at this plan compared to the first one. It seemed as if the magic was gone. However, it also seemed to be much more economical to build. So both contractors came back to rework their bids based on this new plan. More delays. The one bit of progress during this time was that after getting the second round of bids, we felt able to choose our contractor. Stuart Bickley had the job! Then there were more delays while we waited for Stuart’s electrician to bid on the electrical work and get our local provider to give their input. Meanwhile, in early August, we had all four of our children (and both GKs) here together for the first time in five years! Amidst all the chatter and laughter and activity, we managed to find a chance to get their input on our plans. The verdict was almost unanimous. Among the seven (kids plus spouses), all but one preferred the first plan. Their reasons were different, but they all mattered. With plan two, they missed the library area; they missed the open hall at the top of the stairs; they missed a central gathering place; they missed the parents’ bedroom being close to the kids; they missed the centralization of the plan; they missed the bathroom close by. Perhaps the final death knell was the real estate outlook for eventual resale value of the house because of the awkward floor plan. After everyone was gone, Kara and I were discussing my discouragement over our quandary. Plan One was too expensive. No one liked Plan Two. “Why not combine the plans together?” she suggested. 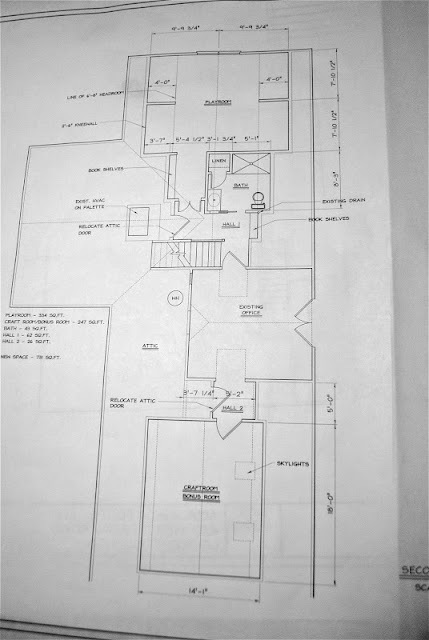 “Keep Plan Two’s smaller bathroom where it is and put the open gathering area/library where Plan One’s bathroom was.” I wasn’t convinced; we’d either have the expense of cutting rafters, or we’d have a tiny library area. 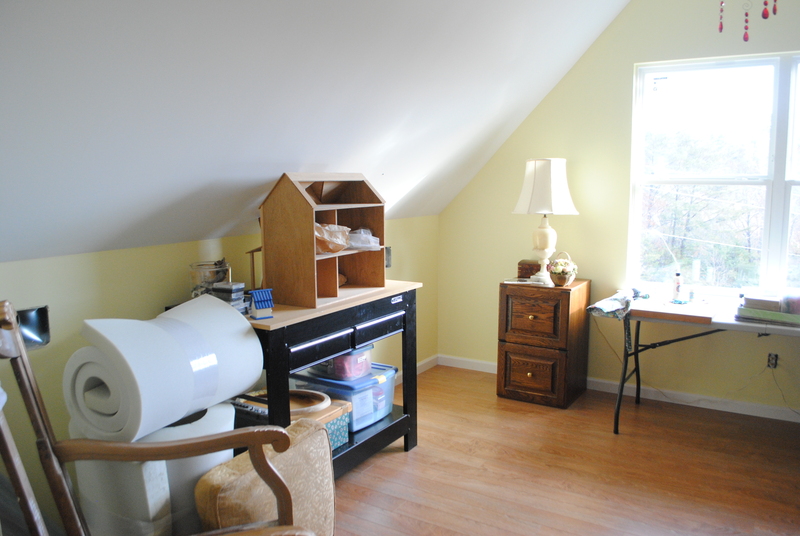 Maybe I could make my craft room serve double purpose as a sitting area . . .
Then Stuart’s final estimate on Plan Two arrived–and it was more than Plan One! Of course he had included electric work and insulation, but still–! We were puzzled and unsure once again what to do. Much as we hated to, it seemed the only thing to do was get Stuart back here and consult.